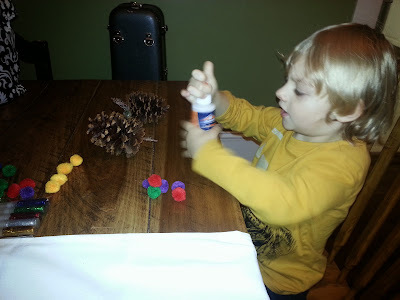 We're having lots of fun making simple little Christmas crafts this season. I have been searching high and low for easy (and I do mean easy) crafts for my three year old son to make this year. 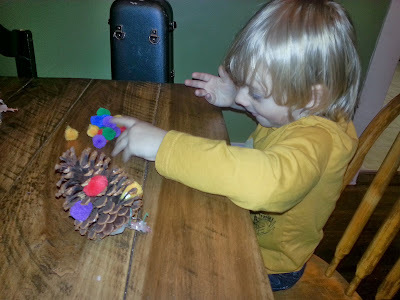 When I found some photos of pinecone crafts, I was instantly attracted, especially to the ones that required few supplies! B, eager to use the glue (had to wait for mommy to help). 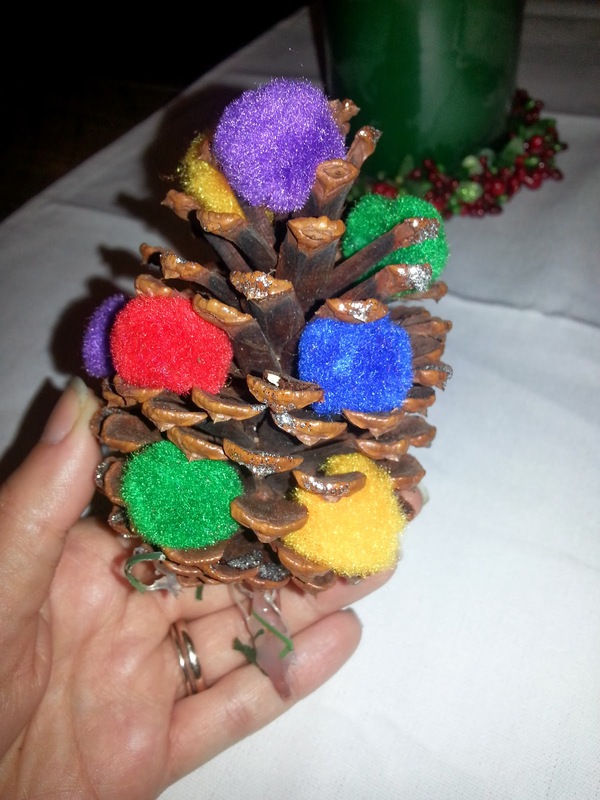 To decorate the pinecones, simply glue the pom poms onto the pinecones. 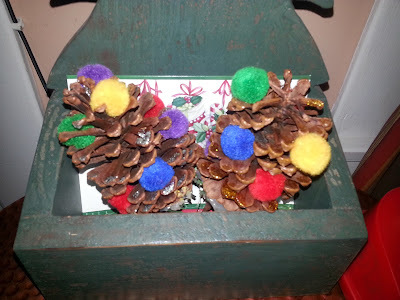 We looked for spaces or holes in the pinecones and then wedged the pom poms into those spaces, adhering them with a little bit of tacky glue. B let me squeeze a dot of glue onto the pom poms, and then he placed them where he wanted them on the pinecones. So much fun, and Christmasy! 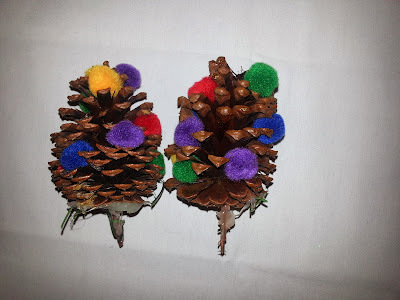 After we added the pom poms and let those dry, we used some glitter glue (silver and gold) to add glittery 'snow' to the tips of the pinecones. This step required a bit more help from me, and my stubborn three year old wasn't to keen on that, but we worked through our differing opinions and wound up having a lot of fun glittering the pinecones! Ta- da... a touch of glitter makes the pinecones sparkle! We had to let the glitter glue dry for most of the afternoon after we made these. Some of the glitter glue was globbed all over the place, and of course, would take much longer to dry. Our Christmas card holder, decked out with the pinecones! I actually had these two pinecones in the card holder to begin with, we just took them out and decked them out! Now they look festively fabulous, and are sitting right next to our North Pole Communicator, where B can see them! He's been very excited to show these off! 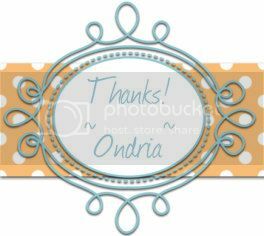 I think these would be adorable, stung together and hung up as a garland! Sometimes homemade decorations are just the best! Looking for a fun craft to do with the kids on a snowy or rainy day? Give this one a try, and don't forget to share your photos on our Facebook page! We'd love to see them! You're so welcome! Hope you guys enjoy!